Lighten Santa’s load this Holiday Season and opt to give an experience rather than a thing. Christmas memories come from the shared feasting, the family jokes, the carolling, the chaos, the crafting – the shared experience. 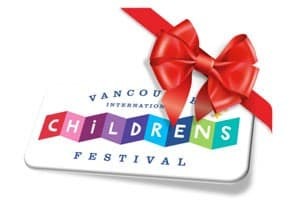 This year, give the gift of a day at the Vancouver International Children’s Festival. The Children’s Festival is a great way to have fun together as a family, stimulate the senses and enjoy world class entertainment. Give your family or friend a day at the 2019 Children’s Festival! 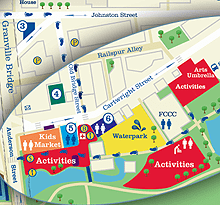 For only $58+GST you can purchase a Family 4-Pack to the Festival, which also includes access to our Activity Village. Gift certificates are also available in any denomination up until December 21st. Sneak a peek at the 2019 lineup, our 42nd Festival! Email or call us at 604.708.5655 to reserve your gift today! Please note that we are not selling tickets to specific shows at this time. Gift certificates can be redeemed once public tickets go on sale in late February 2019 towards the show(s) of choice. I want to purchase a family 4-pack as a Christmas gift to my 3 year old nephew. Could you please tell me how the pack works, what it is good for and if this is age appropriate for a 3-year old?